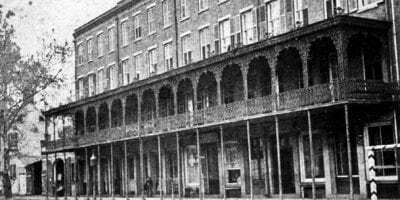 Savannah, Georgia is known as the most haunted city in the United States, and also known as the city build upon its dead. Founded way back in 1733, Savannah has an extensive history of death and tragedies. It also happens to be my home – and we LOVE it! 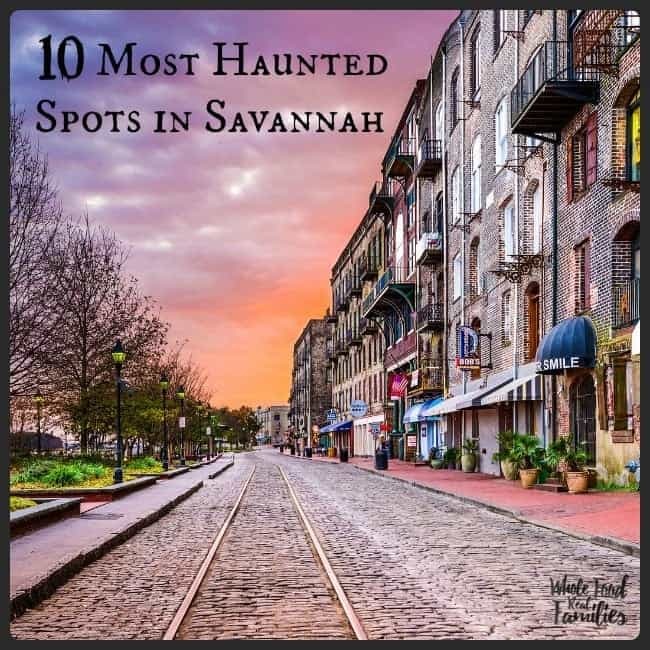 Being a local, we love whispering to our guests about the Most Haunted Spots in Savannah. Over 1,000 soldiers were killed in the American Revolutionary War and their bodies were dumped into a mass grave somewhere in Savannah. Have you been to Colonial Park Cemetery? It has 100s of gravestones but holds more than 10,000 bodies. If you visit, you’ll see a sign where nearly 700 Yellow Fever victims were buried – and that was only 1 of the 3 times the Yellow Fever struck Savannah. Most visitors plan to tour the Colonial Park Cemetary when they visit our beautiful city, as it is a well known part of the Historic District. It is fascinating to watch guests carefully walk on the pathways, and respectfully visit the grave sites that are literally hundreds of years old. But most guests don’t realize they were already walking over graves before they even entered the gates of the cemetary as the bodies extend under the sidewalk and under Abercorn Street, where cars drive right over. And that is only one of the mass graves that we drive on everyday! With mass graves being pretty common, and our roads and buildings being built on top of them, it’s no wonder our great city is so full of ghosts. At one point, burials were allowed in the backyards at private residences, so you can’t really walk anywhere in Savannah without passing over a body (or ten). This makes for interesting stories, haunted tours, and more. The Pirate’s House is the oldest standing building in the entire state of Georgia, and is well known for being haunted. Secret underground tunnels make this place unique. They lead from the basement of the restaurant all the way to the Savannah River. Even if you’re not into ghosts and such, the food here is delicious. They’ve been serving Savannah tasty food and drinks since 1753. With a solid 4 stars on Yelp and TripAdvisor, I’d say The Pirate’s House definitely belongs on your “must see” list! The Marshall House was built in 1851 by a businessman and his wife. It was used as a hospital by Union Soldiers during the Civil War, and also during two Yellow Fever epidemics. Over the years, and even recently, visitors have claimed to see soldiers with missing limbs, children wandering the hallways, and other creepy sights. The Marshall House holds a special place in my heart, because my husband and I actually got married in there, so I’m kind of partial. In 1999, the property was fully restored with original features including doors, windows, and railings. The Marshall House is an elegant, vintage location that is the perfect choice for any occasion. As long as you don’t mind the resident ghosts. The photo to the left is a current photo of the Marshall House. The photo to the left was taken in the late 1800’s. Feeling super adventurous? The Sorrell Weed House is said to be one of the most haunting buildings in all of Savannah! Can you handle it? They offer after-dark ghost tours and paranormal investigation tours. They have four tours to choose from, and each look equally interesting! Are you ready for a “frightseeing” experience? Come explore the most haunted places in Savannah, if you dare, with Ghosts and Gravestones Ghost Tours. The tour starts with some ghost stories about Savannah, followed by a visit to Perkin’s and Sons Ship Chandlery (an exclusive night time stop). Round the tour out with more spooky stories and stops at some of the most haunted places in Savannah. It sounds like an unforgettable adventure! The ghosts of Factor’s Walk are ready to come out and play. Head down to River Street and Bay Street, and you’ll find it. This area is made up of alleyways and buildings on River Street. People (ghosts?) are often seen moving through the shadows in the area known as Factor’s Walk. You might feel sorrow and helplessness while visiting. Are you brave enough to visit on your own? If not, take a guided tour. The other guests will try to protect you, just make sure the dark figures don’t follow you home! You know that feeling you get when you visit a cemetery? Usually it’s a feeling of sadness, sometimes anxiety, oftentimes just grief. Visiting Bonaventure Cemetery is no different, unless you count the ghost sightings in addition to everything else. 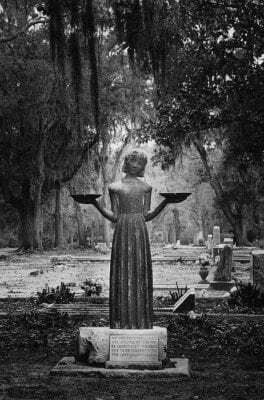 You can visit Bonaventure Cemetery on your own, or on a ghost tour where they’ll point out all the haunted spots, tell ghost stories, and more. Don’t miss the statue of Gracie Watson. She died of pneumonia at the age of 6, back in 1889. Some say they’ve seen the statue cry real tears. Maybe she misses the family she left behind? Visitors often leave small toys at the gravesite. So don’t be surprised if you see them at her grave. 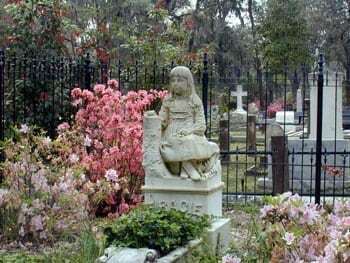 The Bird Girl statue, which became iconic thanks to the cover of the book “Midnight in the Garden of Good and Evil,” first resided in Bonaventure Cemetary. It has since been moved to the Jepson Center for the Arts and is on public display. Serving up Southern Cuisine like collard greens and fried green tomatoes, the Olde Pink House is a lovely dining experience, even though it’s most definitely haunted. It was built in the late 1700s. Some time later, distraught over his wife’s untimely death, the owner hung himself in this home. Visitors say he likes to hang around and straighten the table settings. A place for everything, and everything in its place, right? Learn more about the Gribble House and its horrific history during a ghost tour, if you dare.. The axe murders that took place in this house incited fear in everyone back in 1909, and the ghosts left behind incite fear in visitors today! I don’t know what it is about theatres, but so many seem to be haunted, regardless of where they’re located. Obviously Lucas Theatre here in Savannah is no exception. During the day, they welcome you to take a self-guided tour. At night, you can enjoy entertainment in the form of plays, movies, and more. Before you go, read about the hauntings, especially the ones during the renovation. Spooky! 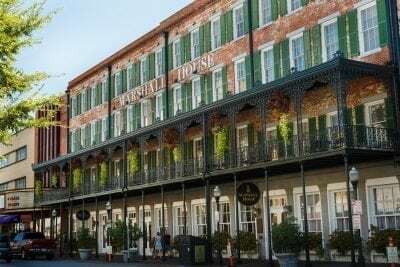 I think the only question left is: Which of the Most Haunted Spots in Savannah locations will you be visiting first? We went to savannah in June. We love it and are going back. Stayed at the River street hotel. I didn’t get to see the Mercer house. that is a must next time. Oh yes, there will be a next time. So good you get to live in this awesome city.